Conversations Curated by My Children’s Pediatrician Dr. Song – Thriving Child Summit Starts Monday! Last year, I had the honor of being one of 40 + speakers in the first Thriving Child Summit, led by the trusted pediatrician of my children, Dr. Elisa Song. It was an amazing opportunity for me to reflect with Elisa about all the things we did to help Ryan thrive after we learned at 18 months old that he wasn’t developing typically and had some real health challenges. You can listen to that conversation here. I’m so excited that Elisa decided to do another Thriving Child Summit this year. I’ve already registered and have blocked off time on my calendar to take in the incredible conversations Elisa has recorded with experts on a wide range of subjects to help our children reach their potential in mind, body and spirit. 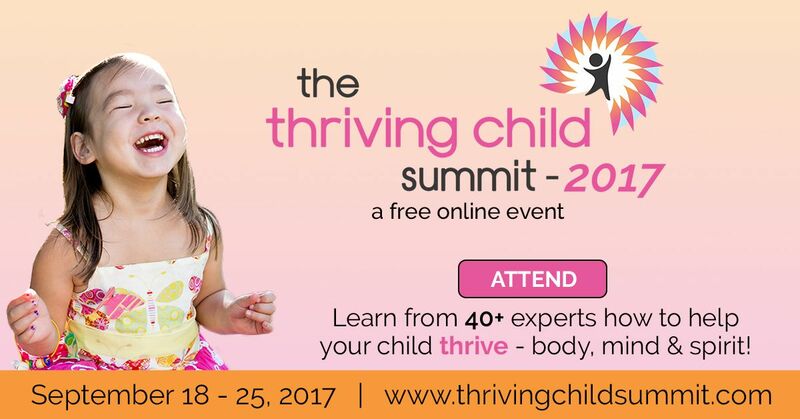 The Thriving Child Summit is a free online conference made up of more than 40 1-hour video interviews with an amazing lineup of experts in holistic health and wellness that starts on Monday, September 18, 2017 and goes through Monday, September 25, 2017. The foundations for optimal children’s health. What to feed your kids (or avoid!) to nourish their bodies and brains. How to use natural medicines to avoid antibiotics and keep your child healthy. The truth about EMFs, GMOs, pesticides, heavy metals, and other toxins – and how to keep your kids healthy in our toxic world. How to find the root cause and heal your child’s leaky gut, anxiety/depression, ADHD, autism, PANDAS/PANS, eczema, acne, and other chronic illnesses. The truth about vaccine safety from two board-certified pediatricians. How to talk to kids about puberty, stress management and social media – so that they’ll actually listen! How to “trauma-proof” your child and create resilient kids for a lifetime. How genetics really plays a role in the future of your or your child’s health. How to reclaim your mama vitality. Dr. Elisa Song is one of my most trusted advisers and a key reason why Ryan is thriving today. I hope you’ll take advantage of this incredible opportunity to gain access to information that will empower you to be the best parent you can be, and learn how to help YOUR children thrive! Hope to see you at the Thriving Child Summit September 18 – 25, 2017! P.S. If you can’t watch all the interviews, you can own access to ALL of the expert interviews at huge pre-summit savings. You can take advantage of this amazing opportunity now through September 18 at 9:00 a.m. to purchase here: Thriving Child Summit. If you use our link, a percentage of the proceeds will also go to support Mother’s Quest. P.S.S. If you haven’t yet listened to my episode with Dr. Song on the Mother’s Quest Podcast you can find it here. You’ll get a sense quickly why I love her so much!